Israeli Prime Minister Benjamin Netanyahu and Serbian President Aleksandar Vucic took part in the Immortal Regiment March, part of the May 9 Victory Day celebrations, carrying portraits of heroes who'd taken part in World War II — in the case of Vucic, one of his ancestors. The two marched alongside Putin, who carried a portrait of his father, a war veteran. This is the first time foreign leaders have joined the event in Moscow. — Дмитрий Смирнов (@dimsmirnov175) 9 мая 2018 г. 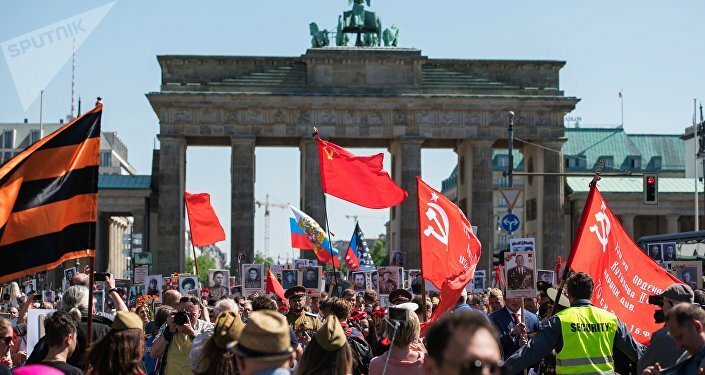 ​The Immortal Regiment is a voluntary noncommercial and nonpolitical march in which people carry portraits of their fathers, grandfathers or other relatives who fought in or otherwise supported the war effort during WWII. Sputnik contacted Netanyahu's press service for help in identifying the officer depicted in the Israeli leader's photo. According to the press service, the man in the photo is Volfas Vilenskis, a Jewish Soviet war hero of Lithuanian origin. Vilenskis fought the entire war, from its first to its last day, and was awarded the title of Hero of Soviet Union. After the war, Vilenskis spent his last years in Israel, where he published a book of his war memoirs and participated in Israeli veterans organizations. Vilenskis died in 1992 at 72 years old. Vucic reportedly carried a photo of his grandfather, Andjelko Vucic, who was killed by the Ustase, Croatian fascist collaborators with Nazi Germany. According to the Russian Ministry of Interior Affairs, more than 1 million people took part in the march in Moscow alone this year. Across Russia, more than 10 million people participated in the event in total.